These are two of the so called "easy" 14,000 foot mountains in the Colorado Rockies. They are easy to get to being only 4 miles off I-70 at exit 221, Bakerville or about 50 miles west of Denver airport (DIA). Patrick and I climbed them on June 14, 2003. It took us about 8 hours for the round trip including over an hour on the two summits combined. The day is an 9 mile round trip from the trailhead with a vertical gain of 3,500 feet. They are the 9th and 11th highest in Colorado. I have climbed them each 8 times as of 2013. In June 2013, I climbed them starting from Loveland Pass summiting Cupid and Grizzly Peaks, both 13ers, on the way. This is a long day with all the time spent over 12,000 feet. 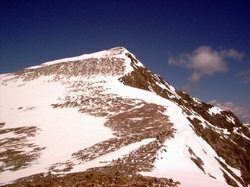 Alos in June,	I climbed Torreys via the Dead Dog Couloir. This report is from my first climb in 2003. At 7:30 AM, we parked the car about half a mile from the parking lot due to trees and snow from a recent avalanche blocking the dirt road. On this mid June morning it was chilly but OK. The trailhead was clearly marked by a Forest Service structure with maps and signs. On this day, there must have been 100 other people. Some simply taking a day hike in the area, others going for the summits and then there were the die-hard skiers! The approach to the mountains is simple. The destinations are clearly visible from the trailhead. 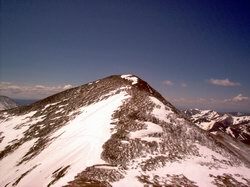 Grays appeared white with snow and Torreys more challenging with it's sharp ridges rising sharply to form the peaked summit. 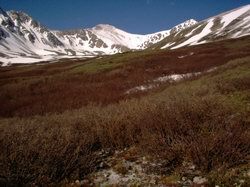 A well worn trail meanders through grassy meadows before making a sharp turn revealing the north face of Grays and the challenging couloirs on Torreys. We choose to summit Grays first followed by Torreys since it seemed the most direct routes and most people were going that way. By now the crowds had dwindled to about 40, including the diehards. Several people had their dogs with them who seemed to enjoy the snow much more than their owners! The trail up Grays switchbacked easily before becoming gradually became steeper. With knee-deep snow, it proved to be a challenge for some on this hill. The views looking north became spectacular as we climbed well above the treeline in this area. Stephens Gulch stood out below and was still mostly covered in snow. Kelso Ridge occupied our view to the west as it rose up Torreys' south side. After three hours, we stood on the summit of the 9th highest peak in Colorado and the highest on the continental divide in the United States. It was a perfectly clear day but the winds were howling. The last hour was very cold and we were wearing all of our clothing including hats, gloves and face masks. 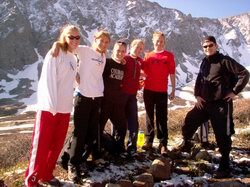 We took in the view as well as some pictures and then climbed 500 feet down to the saddle on our way to Torreys. Torreys looks much higher than Grays to me but actually is a few feet shorter. What it does have however, is a steep summit ridge the ends abruptly on the ... well, the summit. Here we found ourselves alone on a living room sized snow covered mountain top. It only took about 45 minutes to go from one 14'er summit to another! I took Patrick's picture as he bravely took the Tenzing pose. We had some food, made some cell phone calls (hey, this is 2003!) and headed down. The winds had let up and it became a beautiful day. Back in the car 8 hours later, we felt great about our two 14'ers. Patrick had climbed Beirstadt earlier in the week, so he won this round: 3 to 2! 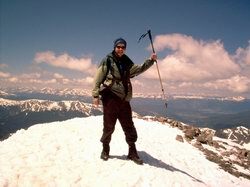 These are two relatively easy peaks but as usual in Colorado, you must be prepared for any kind of weather conditions. We saw people on this climb in shorts and tennis shoes and they looked very, very cold. By the way, the diehards carried their skis to the summit of Gray's and had a fantastic time skiing back to the trailhead - a full 3,000 vertical feet with no lifts! 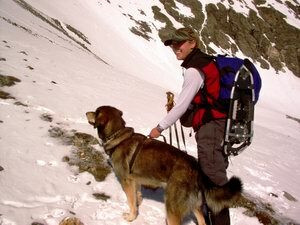 Also, Dead Dog Couloir on Torreys was filled with climbers roped up using ice axes and crampons to summit Torreys the hard way ... it looked like great fun and I have to do it one day!